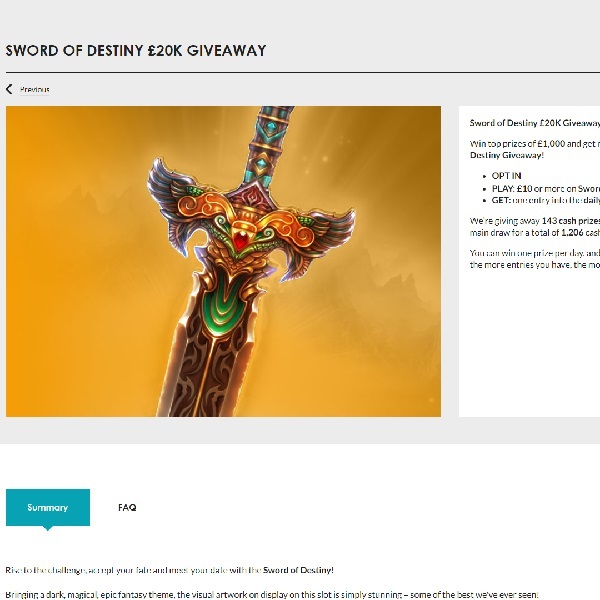 Gala Casino is running a Sword of Destiny £20,000 Giveaway with a top prize of £1,000 up for grabs between now and Sunday. All you have to do is opt in to the promotion and every £10 you bet on the slot Sword of Destiny between now and the end of Sunday will earn you an entry into the following day’s prize draw and an entry to the overall prize draw. There is no limit to how many entries you can earn so the more you play the better your chances. Each day there will be 143 daily cash prizes of £10 and then the main prize draw will award a total of 205 prizes ranging from £10 up to £1,000. Make sure you don’t miss out, head over to Gala Casino today and set the reels spinning.